The following is the transcript of our “Getting Creative with Localist Channels” live webinar that was held on November 16, 2017. This webinar is all about giving you some Channel confidence so that you can not just start using Channels, but use them in the most effective way for your organization and audience. We just recently marked one year since we originally launched Channels, so in honor of the first anniversary we’re going to be starting with some of the basics, but then diving into a ton of creative, clever and simple ideas that you can implement TODAY. WHO can add a Channel? The Channel Admin permission level grants an admin access to the Channel editor. WHAT is the definition of a Channel? Channels are a Localist Promotion tool that generates a new page on your platform. Your platform’s homepage is also a Channel, so any of the ideas covered today can also be implemented on your homepage. WHEN can a Channel be made? Since they aren’t a part of your platform’s permanent classification scheme, Channels can be created at any time and remain live until you’re ready to hide or disable them. WHERE does an admin go to create a Channel? They can only be created and edited in the admin dashboard. Since Channels can be disabled, there’s no need to create test Channels in staging. 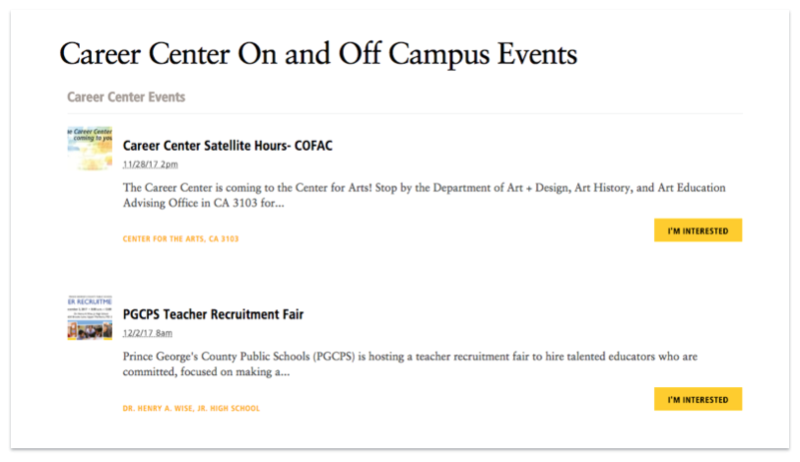 Once they’re live, links to Channels will automatically be displayed on the right column of your homepage. Promotion. This would be the case for temporary needs, like a limited series or festival, or for a more permanent centralization need, like a common theme of diversity or sustainability. You can also pull from multiple criteria, making Channels much more robust than just a landing page or a filter. Marketing. While this is similar to branding, this is referring to the content of the page, with or without unique branding. So for that sustainability conference Channel, this would include additional content like social media links, which we’ll be covering more in depth shortly. Branding. Since Channels can adopt their own unique CSS and layout — the look and feel can be transformed to showcase any particular brand identity. Changing the layout is also a non-technical task as rearranging the components is accomplished by dragging and dropping, plus you can toggle between two columns and a one column layout. Think of a sustainability association hosting a conference on your campus or city that has it’s own flair you’d like to display. That said, branding could be as simple as uploading a unique cover photo that showcases anything from a logo to a scenic backdrop. As you can see, the cover photo can easily be adapted to fit your preferred aesthetic. So what this means is that you can use a Channel for one, two or all of these reasons — which means a Channel can be as toned down or as amped up as you’d like. There really is no wrong way to make a Channel — as long as you aren’t just making Channels for the sake of making Channels (I know it’s tempting!) and that they are serving a direct need for your audience. With your users in mind — properly organizing your Channel content is key, so what exactly does this mean? As I just mentioned, Promotion is the first level of crafting a Channel. Promotion is based off of your existing classification, which encompasses your tags, keywords, filters and landing pages. So, if you have not yet defined your classification that is your first step before moving onto Channels. Tags. These are free text that allow you to provide additional context to your audience. 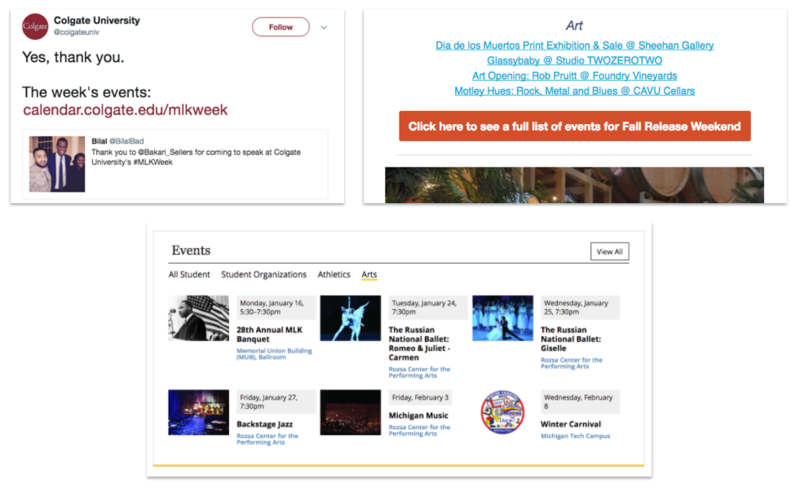 These are publicly displayed so not only can they be used for Promotion, but your users can click the tag on an event to see other related events. 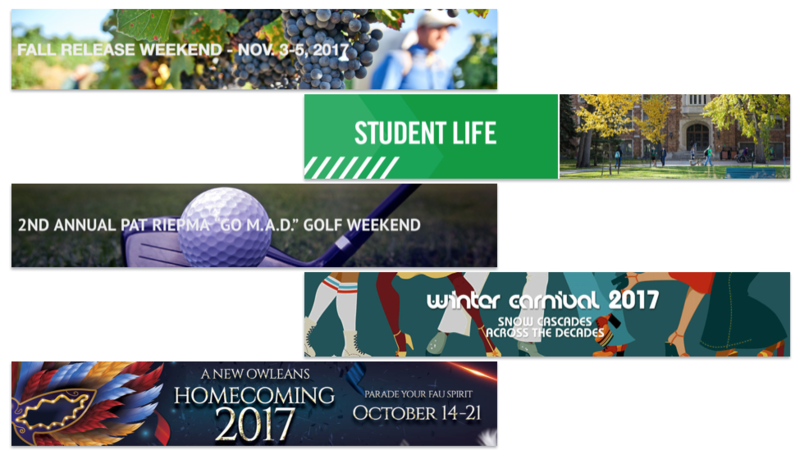 Tags are fantastic for temporary use cases, such as fundraising campaigns, seasonal, homecoming and commencement. Filters & Landing Pages. Additionally, you can of course use your existing filters and landing pages to pull together events that have an overarching theme, but make sure the Channel is adding value to your audience and not just duplicating your classification. Date Ranges. Outside of your classifications, Channels also have the ability to pull in events based off of future and past date ranges. This is the easiest way to spin up a Channel based on seasonality. For example, you could have Channels for “Summer Events” spanning June-August, spring break, Welcome Week and the upcoming holiday season. Multiple Lists. You can even take these date ranges a step further by creating multiple event lists. For example, Colgate decided to organize their Family Weekend Channel by making lists for highlights, Friday, Saturday and Sunday which makes planning super easy for friends and family. 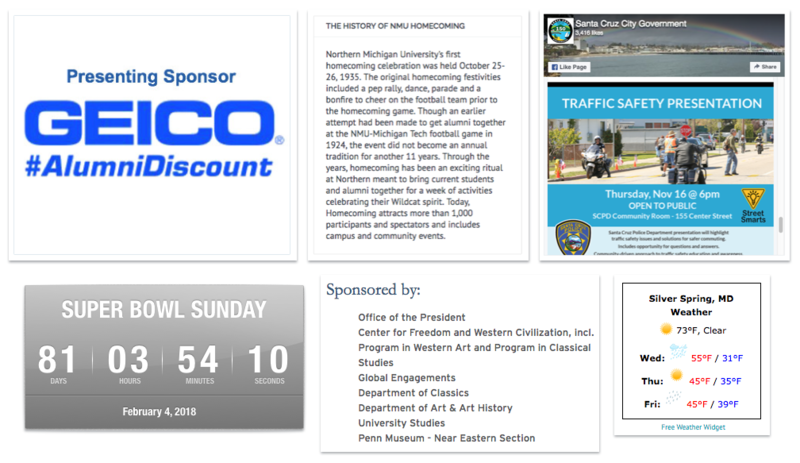 They’ve also taken advantage of our new Spotlight Event component, which is another way to bring attention to a specific event beyond the classic featured slider. Multiple Components. If you didn’t already know, there is no limit to how many duplicates you can have of the same component. 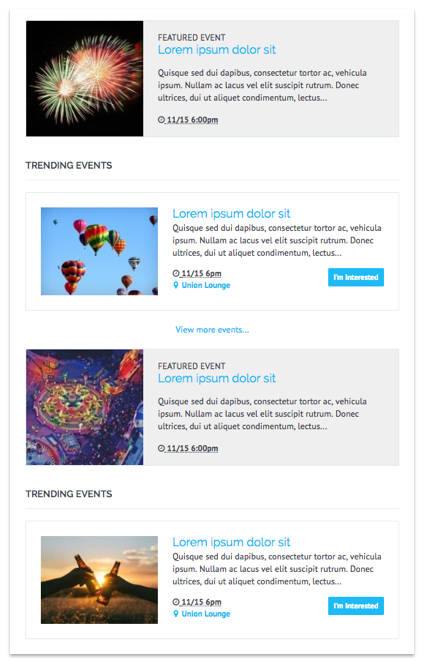 For example, you could divide your page with a second featured slider and second event list. In this mock-up, you can see that we have a slider and event list then another slider and event list, which is a great layout for things like Athletics or distinguishing target audiences. You could have Men’s Athletics in the first set followed by Women’s Athletics in the second set. Channel Only visibility option. This means Channels are now the best way to include everything on your platform without certain events taking over. For example, if you have exhibition listings that are recurring for long periods of time, a Channel can be used to highlight these events separately from the general listings. You do NOT need to even know how to use HTML to take advantage of this component. All of the ideas in this guide are actually just embed codes that you would just be copying into the HTML component. Though of course, if you’re an HTML connoisseur then if you can HTML it, you can make it! There’s two primary buckets these components fall into: interactive and informational. Interactive. This covers anything your users would engage with, whether that’s a link, call to action or multimedia. 1. Simpler links and call to actions. These include the Localist provided social media and website link components, as well as any flashier call to actions for things like donations or ticketing information. 2. Now onto items your users will engage with directly on the Channel. All of these are typically called widgets and are added by copying and pasting a provided embed code into the HTML component. If this sounds familiar, this is the same process for how you add Localist widgets to other pages. If a Channel is music centric, like for a festival or concert series, embed a Spotify playlist featuring a sampling of the performers or compositions. 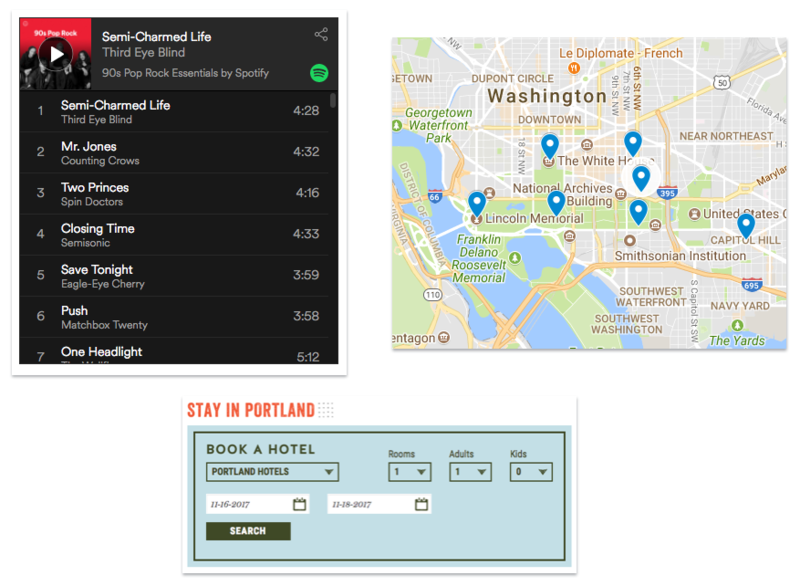 If your Channel is geared towards out of town guests, like for a marathon, a lodging widget would definitely make their planning experience smoother. On a related note, you could create a custom Google Map that features hot spots around town for those same marathoners or say for new students coming to campus. Some other ideas that have come up in conversations are including a relevant poll, news RSS feeds and of course videos. Informational. These don’t require any additional user interaction. First up, Localist provides an out of the box description component so that you can provide all the necessary context. If you’re anything like me, one of the top questions on my mind when making plans is what will the weather be? Not only will it inform my outfit choice, but can impact how likely I am to attend. Give your users an easy heads up by displaying a weather widget. You can also branch outside of the Localist provided social media components and embed social feeds directly in the Channel so users can peruse the chatter without leaving your platform. Another thing that we’ve heard is that users really respond well to countdowns, so if your Channel is showcasing a big conference, tournament or holiday then a countdown is great passive way to generate excitement. Lastly, an HTML component can be used for monetization opportunities by powering Google Ads or manually embedding a sponsor’s logo. This is by no means an all inclusive list, so if you can embed it then it can absolutely be a part of your Channel. Our next Channel strategy actually entails using only HTML components on a Channel, or using none at all to highlight non-event content. You heard that right, your Channel does not technically need to have events, more on that in just a minute. First, when we say non-event content that can mean listings on your platform that aren’t a traditional event or perhaps more mundane, like meetings, closure or construction notices and academic calendar dates. These are also great candidates to be marked with that Channel Only visibility I mentioned earlier. For these instances, you most likely won’t need any fluff–no HTML components or featured sliders, so they’ll fall into the toned down Channel type. On the flip side, instead of having a listing-only Channel, you can absolutely have a Channel made up of only HTML components. Since Channels are essentially just generating a unique landing page on your platform you can treat like any other webpage. 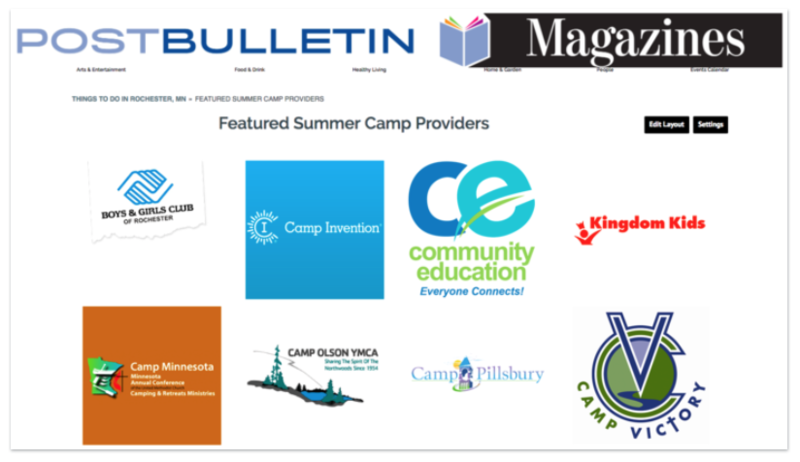 A few scenarios this could be utilized would be creating training documentation for your community, highlighting sponsors like Post Bulletin has done here or creating a Channel featuring a handful of the interactive and informational widgets. 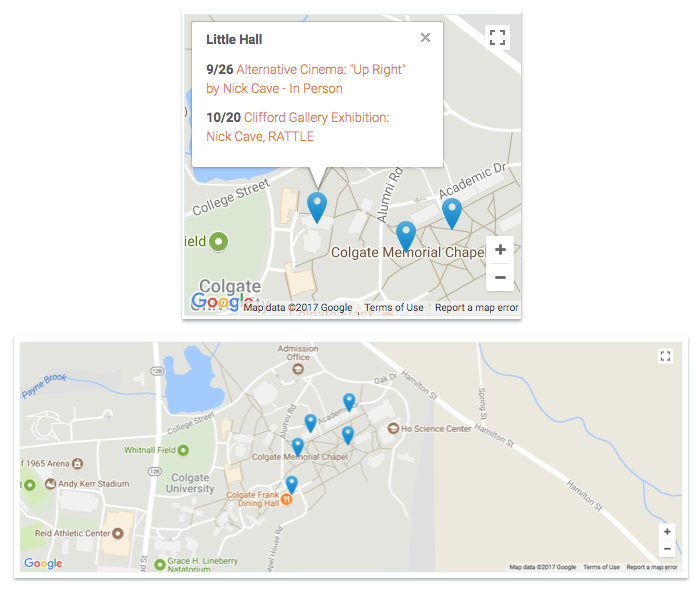 You could even generate a page that just includes our newer map component so that users can see one large overview of where upcoming events are taking place around campus or town. Okay so, now that we’ve covered how you can promote and organize your content. What’s next? Since Channels are often used for bigger or more specific purposes, make sure to include them in your promotion strategies. Remember, Channels receive a clean and custom URL so they make easy call to actions on social media or in newsletters. 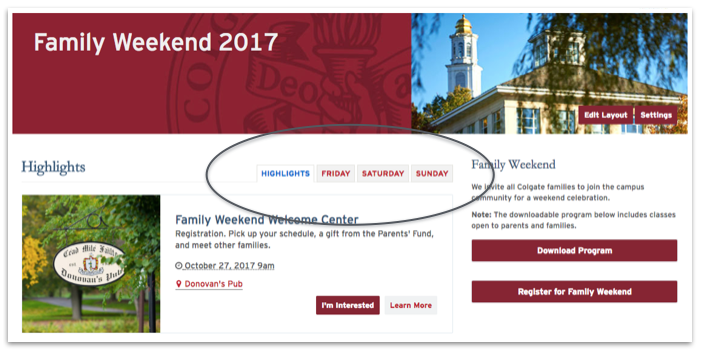 Also, if you have a corresponding widget on an external page then be sure to add a button encouraging your audience to view more content and events on the Channel. Everyone has a use-case for a Channel. Channels require no technical skills. Flexible enough to fit any vision. Q: Are Channels connected to Widgets? A: Great question! Channels and Widgets are not connected, but they are both Promotion tools. So if you want to build a widget to display the same events as your Channel, you can build it off the same criteria by selecting the same Classification in the widget builder. Q: So I’m a Platform Admin, can’t I also make Channels? A: Permissions in Localist are non-hierarchical, so that means that a platform admin does not automatically have control over the entire platform. If you are a Channel Admin, you are able to make Channels. If you are a Platform Admin and can make Channels, this just means that you also have the Channel Admin permission. Q: Why would I use a Channel instead of just a Filter? A: A channel is a place that allows you to display events from multiple different criteria and classifications and allows you to add all of the context your users are expecting. 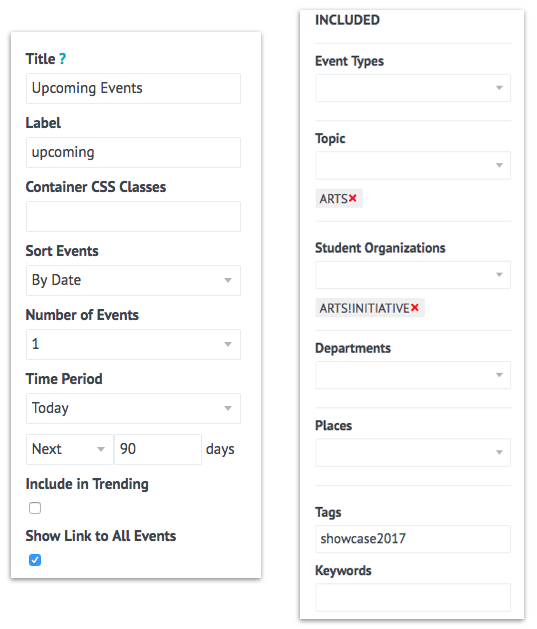 Channels are flexible so you can customize them to look however you want, while a filter only shows the list of events without any additional information. Filters are broad user-centric ways for your users to browse events that interest them, whereas Channels provide a full experience for your users around a short-term event or overarching theme. A Channel should never be built off just one filter, unless it serves a greater marketing context. For a university, having an Alumni Channel built off the filter Alumni to make sure you can add context and components like a Donate button to bring additional value. Or a local library might want to highlight their events for pre-schoolers on a Story Time channel with lots of information around their new program. Q: Once you disable the channel, where do those event listings live? In the home page of the calendar? 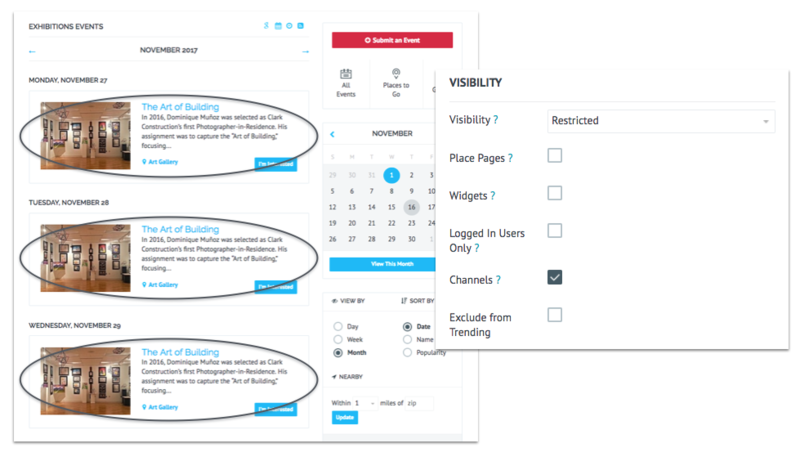 A: Unless you select the “Channel Only” visibility, the events in a Channel will appear on all of the usual pages, like the “all events” page, landing pages, etc. This means they are also applicable for being included in the homepage if they fit the classification defined or they are not excluded from trending. Q: Are we able to have a channel visible but not listed on the homepage? A: Of course! When editing your homepage channel layout, select the “Other Calendars” component and you’ll be able to un-check specific channels so they don’t display in the list. Copyright © 2018, Localist. All rights reserved.